You may notice from some of our pictures that Melbourne can be rather grey at times. Since the early European settlers arrived, the slow old Yarra River has seen many changes. For one thing, it's stately path has been straightened to reduce flooding (the result is the oxbow lake -- billabong -- in the Royal Botanic Gardens). Successive generations have encroached on the river as they built railway bridges and lines, and added riverside parks and roads. We even have a portable floating footpath to enable people to 'walk on water' during festivals. Our diversity is our wealth and strength, and we have been fortunate in the preservation and recognition of some of our 'historic' sites and buildings. The richness and diversity of Melbourne, even on a grey day, can be seen in the variety of the human faces, and in the breadth of our architectural heritage. 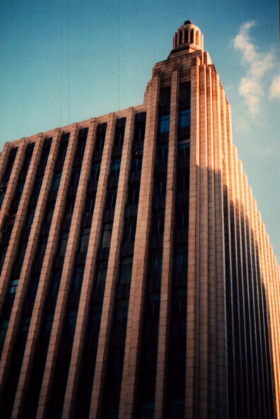 The buildings in this photostory are all listed in the Art Deco Walk of Melbourne, an initiative of the Society Art Deco of Victoria. The Beehive building (above), sadly, without it's original beehive superstructure, but it still ranks as one of the most distinctive buildings in Melbourne. 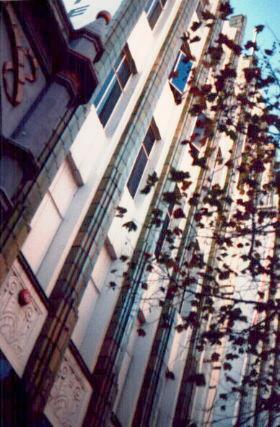 Left: Century Building, Swanston St. This building with it's 'futuristic' green fins reaching up over an otherwise plain white face houses everything from punk and grunge to classical music and Star Trek ®. It has been home to a number of stores including Virgin/ Blockbuster store. Want more? See the buildings on Bourke Street, Collins Street, Queen Street; map; see the walk list.